Chop Andes Mint Candy and set aside. Place dark chocolate in a heat proof bowl over (not on) simmering water and stir until melted. Pour melted chocolate into 8×8 pans, using an offset icing spatula smooth out chocolate until an even layer is achieved. Place chocolate wafers on top and gently press it into the chocolate. Place pan in refrigerator for 5 minutes for chocolate to become slightly harden. Place white chocolate in a heat proof bowl over (not on) simmering water and stir until melted. Remove from heat. Dip toothpick or skewer in green food coloring and then dip it into the white chocolate; stir to combine. Remove pan with chilled dark layer and pour melted white chocolate on top. Using an offset icing spatula smooth out chocolate until an even layer is achieved. 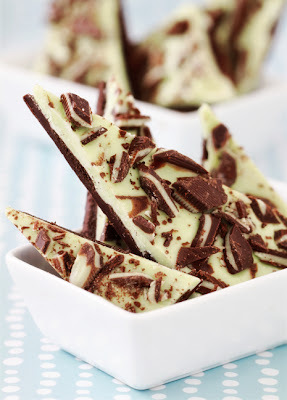 Sprinkle chopped Andes Mint Candy on top and return the fully assembled bark to the refrigerator for about 10-15 minutes or until bark is fully set.